Have you been noticing friends or family members having awesome smiles, and you’re not sure how they got them? You never noticed any alignment tools such as braces or metal retainers present in their mouth. There’s a good possibility that your people were aligning their teeth with a virtually invisible method called Invisalign. Have you heard of it? If not, let us answer a few common questions about this revolutionary method of giving our patients at Noble Smiles Dentistry a new smile! Invisalign is a series of custom-fitted clear aligners designed specifically for your needs. 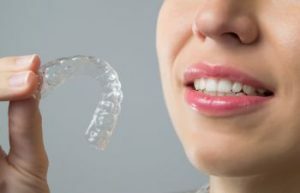 The reason it is a series of aligners is due to the fact that every few weeks you get a new aligner to gently adjust dental issues you may be experiencing such as: gapped teeth, overcrowding, overbite, underbite, and crossbite. The answer to this question is usually, “yes.” However, there are circumstances that may prevent you from utilizing this process. The best thing to do is to schedule a consultation with Dr. Jong-Raye Liang at Noble Smiles Dentistry to discuss if Invisalign is right for you or your teen. The results that you get with Invisalign and metal braces are pretty much the same. However, the means to the end is vastly different. One of the biggest benefits of Invisalign is that you will have no food restrictions because you can remove the trays while eating whatever foods you enjoy the most. You also will be able to navigate your brushing and flossing with ease because you can just take the trays out and get your optimal cleaning completed! Call the Noble Smiles Dentistry office today to get you on the road to a brilliant new smile today!